We already know that styling men's clothing is possible and I have been seeing a lot of women rocking them in the fashion scene. I have a lot of men clothing in my wardrobe and they will always be one of the clothing items I grab whenever I want an easy and comfy outfit of the day. Even when I travel, a good oversize men shirt is the best choice to wear. 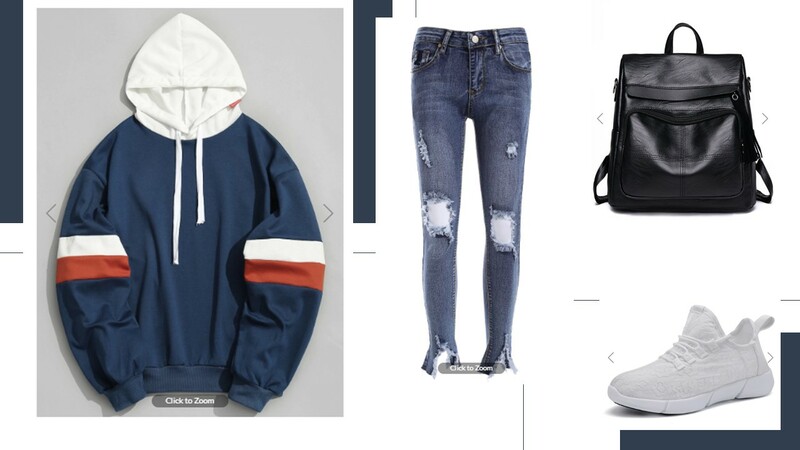 Hoodies are also a women fave in styling men's clothing. All men's items are available at dresslily and you can view more of men's outfit on the site. I love the contrast detailing on this hoodie, a very stylish approach for a modern hoodie. This will be good and comfy if it is oversize, a good choice to wear on a travel or on a cold weather. I also love the blue and white color combination. It is masculine but it will be a stylish woman outfit if you pair it with a good denim. My rule when I wear oversize is to pair it with a tight jeans or vise versa especially to all the women that are short. This denim pants will go perfectly with the hoodie, a good ripped jeans is a must to any wardrobe. I love the ripped/raw hem that gives a more rad to the whole outfit. I will always say that you can't go wrong with a white sneakers, they are easy to style and pair it to any outfit. This shoes will give that athleisure style to the outfit. Having a comfy shoes for the entire adventure. Leather will always give a masculine feel to any items and it is a versatile piece to style in any outfit. Women now a days are not afraid of rocking any masculine accessories, it is believe that you have the cool side. This bag will give the outfit a more cool vibe and keeping all your belongings in one place.